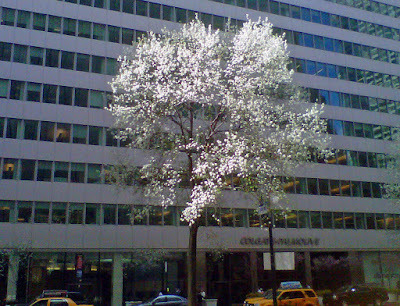 Spring officially began yesterday, but in New York City, trees don't often blossom before early April. This year it's different, as this view looking across Park Avenue towards the Colgate-Palmolive building shows. 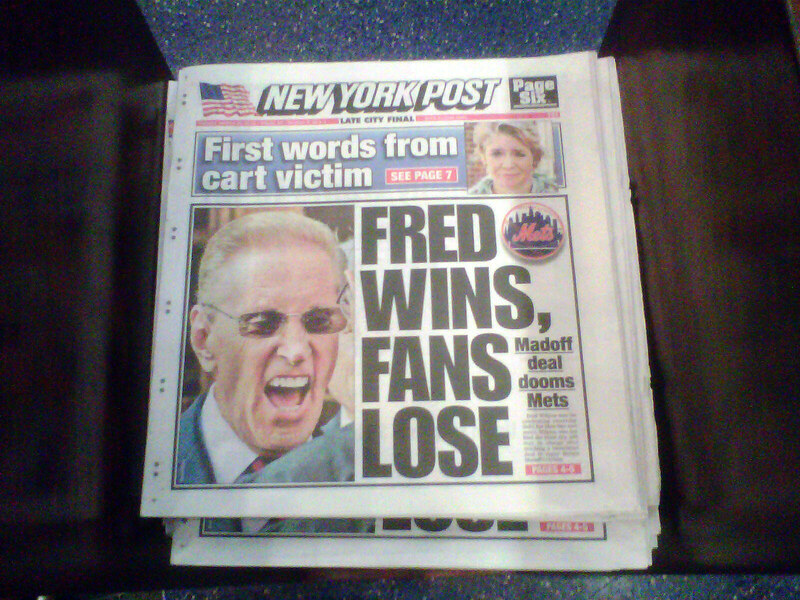 Does the Madoff settlement doom the Mets? 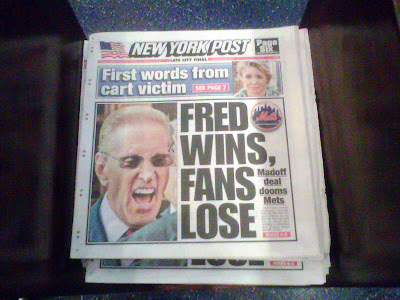 This was the New York Post's take on the settlement, which limits the liability of Mets owner Fred Wilpon to the trustee in charge of winding up the affairs of, and paying claims against, the bankrupt investment enterprise of convicted Ponzi schemer Bernie Madoff. Many fans were rooting for Wilpon to lose, on the theory that it would force him to sell the team to a more deep-pocketed, and perhaps more competent, owner. Harvey Araton, in the Times, has a perhaps predictably less hysterical view of the situation. While I've sometimes fantasized about going to a Mets game and, with a little help from my friends, unfurling a banner over the upper deck railing emblazoned with "Why can't we fire the Wilpons? ", contemplating a change of ownership has, for me, always posed the devil-you-know versus the devil-you-don't quandary. My modest hope at present is that the Wilpons, Père et Fils, will let Sandy Alderson and Terry Collins manage with the resources they have. I'm glad to stick with the team (indeed, David Brooks suggests I might lack character if I didn't) through a period of re-building, if it's done right. On my almost daily walk to Brooklyn Bridge Park and back yesterday, I saw a car of a kind I hadn't seen in years: a Sunbeam Alpine. An Alpine, in light blue, was my second car. I had it from 1965, during my first year of university, until 1971 when, in what retrospectively seems an act of insanity, I traded it in for a Chevy Vega. Sunbeam was a marque of the English Rootes Group, which also made cars under the Hillman, Humber, and Talbot names. The Alpine shared its chassis with the Hillman Husky, a small station wagon or, in British parlance, an estate. This made it quite sturdy but, by sports car enthusiast standards, the chassis was a bit hefty for the Alpine's four cylinder engine. I found mine peppy enough.